During my oration on the occasion of the PAOCA Football Club’s ninetieth year celebration, I attempted to bring through to our younger members/players, “threads” that unite the past and the present. Being one of the “older” set, it is important to me that the “younger” set understand who they are, and what they should stand for. In particular, it is the School, PAC, which is at the basis of the whole deal, and this should never be overlooked. Jack Parkinson – later became Mayor of Burnside. Son Peter was a member of the 1966 A2 Premiership side, then became A Grade Captain, followed by his son Jim, who played in the 80s and now one of the leading figures in the Club’s administration, and whose son (great-grandson of 1926 player Jack Parkinson) is a current player. How about those for “threads” – THE REDS’ THREADS!!! Peter Parkinson – father of Jim. Has grandson currently playing. Was A grade captain 1968-69. Great Club man. Came all the way from Queensland to attend. Tony Cranston – also great Club man. Ian Ide – All Australian, our centre half back, gave the team great “spine”. Apologies received from Bill Lodge (Queensland), Mark Skinner (NSW), Brougham Clarke (ACT) and Ian Wallace (since deceased). The gap between A2 Premierships was 49 years. Maybe year 2016 will bring the Club’s first A1 Premiership. Our “threads” will really be jumping then!!! Thirdly, I was able to arrange for Dr John Bundy, a fit looking 92 year old, to attend the function. 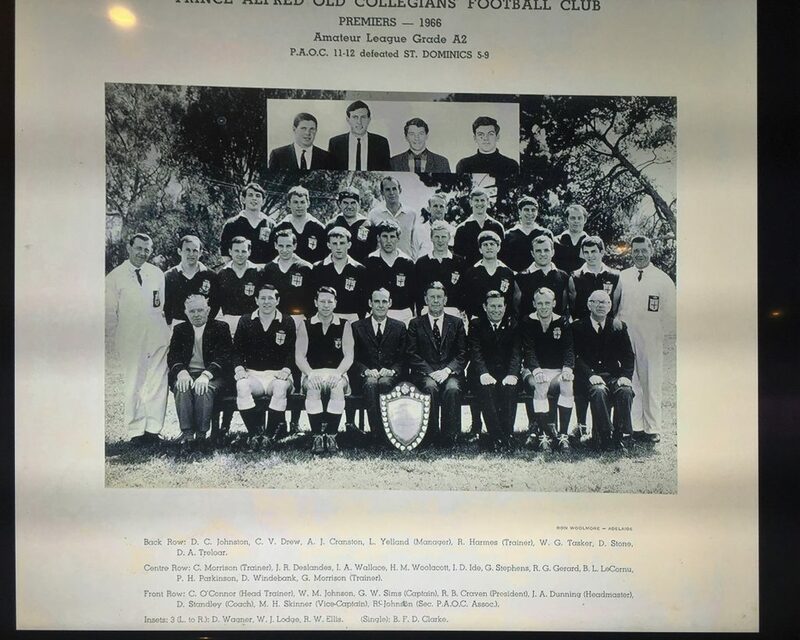 John played in the Club’s 1946 A2 Premiership Team after the recess for the war years, 70 years ago. John was born in 1923, three years before the founding of the Club. He was captain of the School in 1941, vice-captain of the first eighteen where he was known as a “fast and determined ruckman”, and vice-captain of athletics. In 1973, John was President of the Old Scholar’s Association. In attending our 90th celebration event, John was accompanied by his son Bill, also a past player of the Club. Just another ”Red Thread”!